Hello! For now (at least), I will be the sole chica writing this blog. Ash's schedule is much busier than my own, but keep an eye out for her comeback! Today's novel took me by surprise thrice for the following reasons: it's a YA/teen book (adults, too) that is written during the Mt. Vesuvius eruption; it's amazing in every way possible; and it kept reminding me of an episode of "Doctor Who." (Okay, so the last one was a personal thing, but still!) I truly couldn't get enough of this novel! 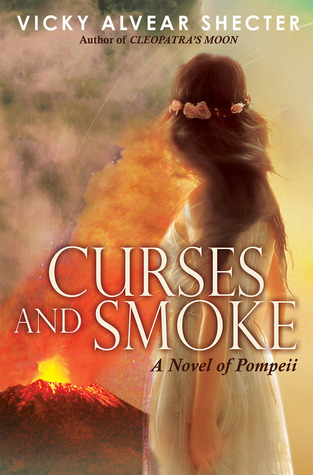 It's Curses and Smoke by Vicky Alvear Shecter. Such a gorgeous cover, too!!! Summary: "When your world blows apart, what will you hold onto? Lucia is not just some poor little rich girl, and Tag isn't just from "the wrong side of the tracks." It's just not something that is that superficial like that. Their story goes deeper; they were friends who grew up together, neither of whom are whiny and expect the other to "save" them; they're more developed and realistic than that. They're strong. Even the "extras" in the book are developed and have back stories. The story is addictive and it's not like anything that I have read before in any novel in any genre. I think it's because of the plot and history and how they were carried out, to be honest. The plot is put into days that count down to the eruption, alternating the point of view between Tag and Lucia. This can go very well in a book, or it can go swimmingly. This time, it was great. You get to see two completely separate and different lives from that point in time. Then comes the history. The rich history just completes the entire novel. How did people live back then? Were there warning signs? Were they anything like us? (The last answer in this book is yes, and you'll feel like you're there!) You'll want to learn more about the eruption and what came of it. I am trying not to give any part of this story away, because I want you to feel the surprises and everything with clear wonderment and enthusiasm of reading such a unique, new book! In Conclusion: OMG! READ THIS NOVEL! TEENS AND ADULTS!